So I've had an idea in my head for a while now and the only way I feel I can get it out of my head is to write a blog post. So some context; I'm sitting in my office completing my appraisal, reflecting both on what I've done in the past year and what I'd like to do going forward and it strikes me that I cant see myself sitting here when I'm 50. Now before anyone accuses me of being ageist I believe I could do the job perfectly well when I'm 50* and that someone else with the required skills and experience could do the job perfectly well when they're 50. So my question for this community is "Does age matter when it comes to managing an intranet" Here are my thoughts on the matter. "Being down with the kids" and understanding how they use new technologies and that you use the same can be a boon. For example describing something as similar to Facebook or Twitter only makes sense if you actually use the tools yourself. On a related note I don't think you can encourage people to use Twitter if you're not using it! Being creative is another key skill, as intranet managers are likely to be creating content that needs to be engaging. Are younger people more creative? I'd love to roll out a report that says they are, sadly I cant! Having actually now sat down and written this blog post it doesn't seem as long as I thought it would be also apologies to anyone who thinks any of my comments are patronising, they're certainly not intended to be. So what do people think of my not very well thought about points! Just me and my role or does age really matter? *There is no particular reason I chose 50 it just happened to be the age I thought of at the time of writing this blog post. Earlier this week I took part in a panel discussion on choosing an Enterprise search tool at the KM Legal Conference. The idea behind the panel session was that three law firms would explain what motivated them to choose a particular enterprise search tool and to explain some of the functionality available within the search tool they chose. The law firms were using different search tools and the tools were at very different development stages. Although the panel session went well one of the comments I saw on Twitter was that we hadn't drawn any conclusions about enterprise search. Now this could mean a number of things but the impression I got was that people wanted to know whether enterprise search is worth doing, so here are my thoughts. Yes Enteprise or Federated search is worth doing, we work in organisations that are generating more and more information at a huge rate. Having a tool available that allows individuals to easily access content that they may not have previously been aware of is in my mind essential. Enterprise or federated can also be useful when individuals are looking for experts or experience type information. Surfacing this type of information is especially important where your organisation effectively sells knowledge like law firms. However Enterprise search is something that you can very easily get wrong. You can index too much content and end up adding to the problems that already exist. You can index the wrong type of content and the search is never used. You also have to be aware that an enterprise search tool can look fantastic but if you put rubbish into your search (the metadata/indexes) then you're going to get rubbish out. There is also increasingly going to be a conflict between different systems, with many organisations looking at or using a combination of the search available as part of their Document Management System (DMS) an enteprise or federated search tool and the search capabilities available within SharePoint. 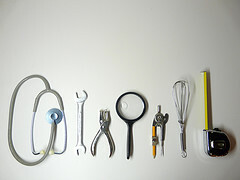 Each of the tools offers something slightly different both in terms of functionality and how results are returned. Identifying what works best for your organisation is one of the hardest parts of deciding whether Enteprise search or another search tool is going to work. Share Knowledge - you know you want to! ﻿ Earlier this week I attended a CILIP in London event called "Knowledge Management from the frontlines" the discussion was faciliated by James Andrews from the British Red Cross. James spoke with great passion about Knowledge Management and some of the tools that the British Red Cross were using to facilitate Knowlegde Sharing. Before I get into the detail of the discussion I wanted to relate a moment of madness that occured just before the start of the discussion. I was preparing to tweet when someone tapped me on my shoulder and asked me to turn my "phone screen off" because it was reflecting the light. I was momentarily taken aback and didn't say anything to the individual but did turn my screen up to full brightness, yes I am that mature. Shortly after this I tweeted to say I had been asked to turn my phone off, this tweet was met with a flurry of headesk, face palm and other ways of saying what a quaint approach this was to audience participation at an event. At the end of the event I was approached by one of the organisers who apologised and indicated that this had happened before with the same individual. I just hope it doesn't happen again! Back to the actual event and James started by introducing himself and the organisation he worked for. He didn't have a PowerPoint presentation so did really well under these circumstances to explain some quite difficult concepts. One of the first things James asked the audience was what they thought Knowledge was, cue lots of head scratching and discussion within the audience about Knowledge. Now I don't have a definition of Knowledge and I think if you put a room of Knowledge Managers together they would all say something different. My feeling is that Knowledge is actually a couple of things, Data and Information. Data is a specific fact or figure, without any context. For example, the number 1,000 is a piece of data, as is the name Tom Smith. Without anything else to define them, these two items of data are meaningless. Information is data that's organiseed. So, pieces of information are "Tom Smith is a CEO" and "1,000 widgets." We have more details, so now the data makes more sense to us. Knowledge, then, builds on the information to give us context. Knowledge is "Tom Smith is the CEO of our company's biggest competitor, and his company ships 1,000 widgets every hour." Explicit knowledge includes things that you can easily pass on to someone else by teaching it or writing it down. This kind of knowledge can be captured in a staff handbook or workflow. Tacit knowledge is less concrete. It may relate to the best way to approach a certain person for their help or co-operation, or how to fix the photocopier. This type of knowledge is usually acquired by experience. In reality what this will mean is that a number of tools/systems are used to capture and share knowledge. There are two different ways of capturing and managing knowledge: using technology-based systems, or using softer systems. Examples of softer systems are shadowing or mentoring. These systems are better for sharing tacit knowledge. Examples of technology based systems would include a co-authored staff handbook, communites of practice or wikis. It is easy to access this information, but it takes effort to keep it up-to-date. These systems are good for capturing explicit knowledge. & many many more! much like Librarians! I thought this was a very interesting dicussion, although I think it would have been useful for James to have had a screen/PowerPoint as there were a numebr of tables/charts we could only look at on paper. I believe this was because of the venue not because James hadn't prepared one. After the event CILIP in London were kind enough to forward the details of some of the resources James mentioned during his presentation. Of these two videos are the most interesting one of which, on how to organise a Childrens party I've embedded below - enjoy! How do you get people to "participate" or to use an intranet/collaboration tool? If you were to sit down and think about this I imagine you could all come up with a few ideas and the internet is certainly awash with them. So I thought I'd sit down and think about how I'd encourage people to participate. This list is by no means exhaustive and although some of these ideas have worked, they're not right for all organisations. It might seem obvious but you have to make the tool easy to use. If people are presented with a user interface that's buggy or clunky or both then they're unlikely to use it again. You also need to be creating content on a regular basis. Individuals want to see that their content is going to be either updated/read by other individuals or is part of a growing resource. Also nobody wants to be the first person to still their head about the ramparts so populate the intranet early on. Something that might work is to give individuals recognition/provide competition. Yammer is very good at displaying recognition in leaderboards and I have no doubt that we'll see more organisations looking at how they can use gamification to encourage collaboration. An important part of any intranet is providing content that people need, rather then just swamping the intranet with useless content. Making content relevant should encourage people to read the intranet. If you don't know what people want, you should ask them! 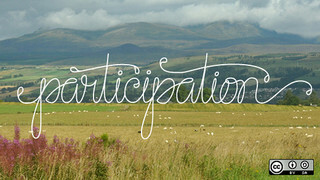 Giving power to the people is a good way to encourage participation. If you make individuals/departments responsible for adding and updating content it's more likely to stay relevant and be read. At least that's the hope! Make it social by allowing individuals to comment on content, post "fun" stuff and connect with other colleagues. But remember your intranet will be serving a specific role and that probably isn't a place for people to have fun. Finally if you can, only post important information to the intranet. This is a tricky one as everyone will say that they don't read the intranet and so will miss stuff, but if you can do this then it will certainly impact on usage. Those are my errm top 7 tips, not exactly a very round number. What have I missed?